Every time I see a Rain Tree, I’m overcome by an urge to run into its arms. Hug it and just be. I met this sturdy grandmotherly presence on Bangalore’s roads, so majestic with its tangled arms holding up the sky. It is said Simon Bolivar camped his entire liberation army under the “Saman de Guerra” near Maracay, Venezuela. If you’ve taken a walk in the newly paved avenues of Bangalore, you’ll also notice their seed pods immortalised in the tar. Roads may wash away but these pods remain a perennial bumpy presence. It has puffy pink silky flowers which are easy to miss till it rains or the sun sets earning it the name pukul lima (five o'clock tree in Malaysia). 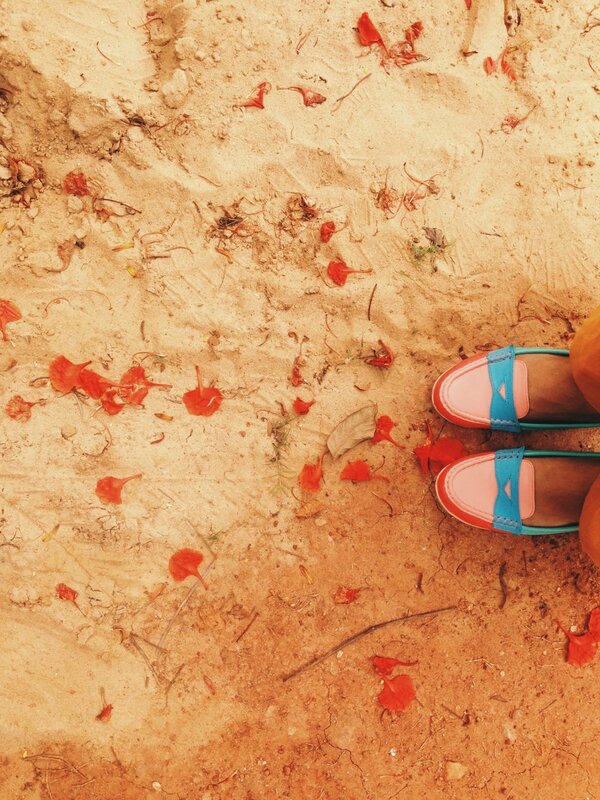 The leaves fold in “sleep” and these pink beauties stand tall. I can see how this tree can be easily mistaken for the Albizia julibrissin, the Silk Tree or the Pink Siris. I’ve often wondered how I’d be able to tell the difference and the answer lies in the leaves. The saman has larger droopier leaves. The julibrissin on the other hand has characteristic mimosa leaves. Tiny tamarind-like leaves, that look very similar to the touch-me-nots on the roadside. Interestingly, both trees belong to the pea/legume family and have light sensitive leaves. 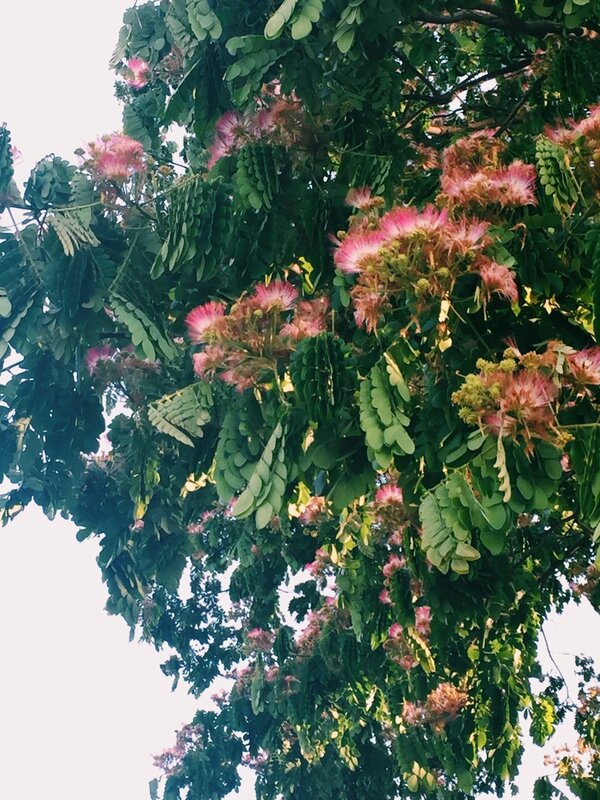 There are other Mimosas to be had: I’ve been looking for an Albizia lebbeck (Indian Siris) for the longest time and I recently found one in Delhi! For now, I’m focusing on Bangalore. Dilli dur ast. Have you met a tree you didn’t love? Today I met so many trees I wanted to hug. 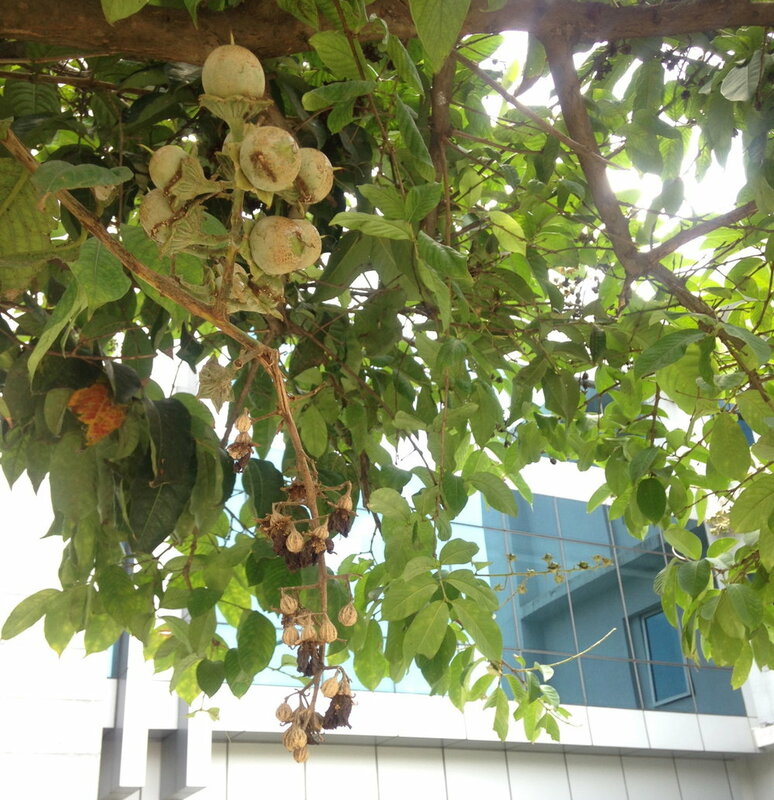 A chikoo tree, laden with brown orbs hiding under leathery green leaves; reminding me of dusty sunsets in the desert. Then round the corner from it was a moringa tree - mauve flowers and drumsticks like a witch’s talons. Countless tongues wagging in the evening breeze. The drumstick on the highest branch is always spared the sambhar. Across it was a tree of custard apples. It’s a shy introvert this one, stands in plain sight with fruit the colour of leaves. No one seems to love these, they’re always hanging out by themselves - near petrol pumps in Jeevan Bhima Nagar, watching a garbage dump in Indiranagar, lonesome by the temple in Yemalur. Then the mango trees, full of leathery copper-brown-red fresh leaves and bunches of flowers-in-the-making. A blushing bride and an expectant mother all in one. What’s the Tamizh word for that colour again? My grandmother had a saree that colour. My cabbie took a wrong turn this evening. Serendipity is my favourite word. This is the tree I’d call Flame of the Forest only to realize very recently that that one is a different tree. This one’s just good ol’ Gulmohar or simply Flame Tree. Its name finds its origins in Persian: gul rose, flower + muhr seal. I love the Gulmohar’s distant cousin the Peacock flower a teeny-weeny bit more but I’ll leave my paeans to the red-peach-yellow flowers for another time. When I tried to photograph the Gulmohar lined streets of Indiranagar, I almost got pulled over by the cops who’d parked themselves right under a tree near Toit. Never ones to be short on self-importance, they thought I was photographing them! Earlier today in Frazer Town, I saw a man with a henna’d beard the color of gulmohar blossoms standing against a majestic Albizia Saman. All I could think of after that was funeral pyres, bonfires and the castor plants on fire by the railway line yesterday- licks of fire jumping out to touch the sky and then just as quickly the grey smoke as if the ice blue coldness of had killed the fire’s ambition. Slow down you crazy child, you’re so ambitious for a juvenile. O gorgeous boon of the spring? Rich red of a wild bird’s wing? On the brow of a serpent-king? Of your dazzling, fugitive sheen? That colour the ocean’s mien? To succour a Rajput queen? Of your frail, victorious fire? Quick flame of my heart’s desire? From a true wife’s funeral pyre? Photo Credits: My friend Les shoots plants and flowers very well. The up close and personal shots of Gulmohar are by Les. Everywhere else in the world this tree with popsicle-like mauve, lavender, lilac, pink, shades of purple & pink flowers is called Queen’s Crepe Myrtle or simply Crepe Myrtle. It gets its widely known name from the crepe paper-like crinkly texture of the flowers. Oh, another thing. We in India call it the Pride of India and the Postal Department even issued a stamp in its honor in 1993. Indonesia however does a better job with the visualization. So pretty, no? I met the ruby red frangipanis for the first time when I joined 247 last year. I’d only ever met the white with yellow centers champa flowers before this, the White Frangipani Plumeria alba. This is a central courtyard where my manager and I’d have our meetings. Let’s not sit in stuffy meeting rooms, I’d plead. And so it was that conversations, one-on-one’s as they’re known in the corporate world would happen here. Wikipedia tells me that Frangipane/frangipani is derived from frangere il pane (Italian for “break the bread”), from which the noble Frangipani family of Rome derived its name in the 11th century. It is said a certain Frangipane was perfumer to Louis XIII of France, hence the common name Frangipani. Plumeria on the other hand is named in honor of the seventeenth-century French botanist Charles Plumier, who traveled to the New World documenting many plant and animal species. I don’t visit the frangipani anymore but walking back from lunch today I noticed the tree reaching out to hug the sky - arms all tangled, ruby-red clawed. As a ten year old I wanted to be a gardener, florist, botanist in that order. I spent endless hours in my Grandma’s garden attempting to eat, grow and befriend everything that would make even a feeble attempt to find root in the red Mangalorean soil. There were begonias to taste, veggies and flowers to grow - carrots (very unsuccessful) to sweet potatoes (moderately successful) to button roses (wildly successful) - and trees to befriend. I find unbound joy when working with my hands, moulding and shaping things and then seeing the efforts bear fruit. Remembering that led me to rekindle my love for gardening last year by starting my own li’l organic veggie garden. Anything I find in my kitchen finds soil in my garden and then my undivided attention and smothering love as I cajole ‘em all to come out and see the sun. A couple of weeks ago I was out for lunch at Fatty Bao with a few colleagues. One of them pointed to a tree and remarked how round the Jackfruits so high on those tree were. Only those were Breadfruit. That led to a round of a ‘Name the Trees’ and I was left thinking how long it’s been since I looked around with wonder. I’m the one who calls out names of trees when driving down roads (Hey, look African Tulip!) and picks up seedpods to touch. Where did that unbridled curiosity go? I spent the weekend reading about trees in Bangalore. That’s when I learned that the Flame of the Forest and Gulmohur are not the same trees. The tall noise reduction tree I’ve called the Ashoka Tree is actually the Fake Ashoka Tree! Despite spending many evenings walking under them, I still can’t tell the Albizia Saman from the Albizia Julibrissin. This is my attempt to fix all that.